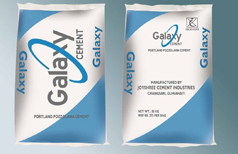 Galaxy Cement is the brand of Joyshree Cement Industries. The recently commissioned Grinding Unit has a capacity of 300 TPD. The plant is having the latest technology for cement grinding equipments are from world's renowned companies. The plant is situated at Village- Sila, Laxmi Nagar, Sila Sindurigupha, Changsari, Dist.-Kamrup, Assam. The unit is marketing the cement under the brand of “Galaxy” and “Jumbo Shakti”.